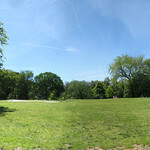 The Great Hill is an open hilltop meadow with picnic tables, a three-quarter mile soft surface oval path (good for a jog), and green grass under stately American elms. The best time to go is from 6 AM to 8 PM (when it gets dark). There are water fountains and bathrooms available. Dogs are allowed. Olmsted and Vaux designed the Great Hill as a carriage concourse where passengers could enjoy commanding views of the Hudson River and the Palisades, but with the passing of time and the growing of trees, the view slowly disappeared. In the 1940s and 1950s, the Great Hill was turned into a recreation area with bocce, tennis and volleyball courts, and horseshoe pits, but by the 1980s, it was an abandoned and dilapidated ruin. The restoration of the landscape in 1993 as a place for community leisure finally gave the Great Hill the contemporary identity it needed. Now, the Great Hill is the site of family and church picnics, frisbee games, running or race walking on the oval track, musical concerts, film screenings, and the popular series of free multicultural performances and art workshops for families called A Clearing in the Forest. A video of Festivus 6, one of the many events that goes on at the Great Hill. There is live music and food. Everyone is welcome to sit and eat on the grass or walk around or dance. The events are free so anyone and everyone is wecome.